Green Day’s American Idiot is one of the greatest and most ambitious albums released this century. An epic 13 song “punk rock opera” that tells the story of a kid from suburban nowhere, it tackles themes of war, capitalism, suburbia, and the bleak political landscape of the early 2000’s. The song “Holiday” is the third single off the album and was released in March of 2005. It serves as the transition song for the main character of the album’s story, Jesus of Suburbia, moving him from his terrible hometown to the big city. 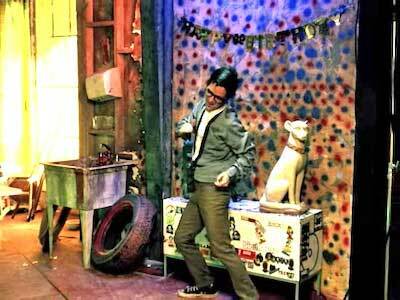 Billie Joe Armstrong’s “Nerd” character. While this song does tell the tale of Jesus of Suburbia, it has a lot more to do with the band itself, and doesn’t try too often to speak from the perspective of Jesus of Suburbia. The track acts predominantly as an anti-war protest from Green Day, with some specific jabs at the Bush administration for returning the US to war in the Middle East. The phrase “on holiday” refers to the apathy many Americans had about the ongoing war in the Middle East at the time, and the song urges them to not just sit back and watch things happen like they’re on holiday, but to stand up and do something about it. For Jesus of Suburbia, the song chronicles his move out of the suburbs and to the city, where he begins living on the streets. This song is him telling himself that this is the right decision because he “beg(s) to dream and differ from the hollow lies”. Therefore he couldn’t have stayed home and he has to take the risk he’s taking now. 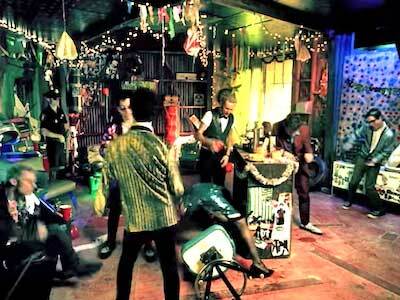 The band portrays different characters in the bar scenes. The music video begins with the band riding in a convertible through the neon city of Las Vegas. These scenes are spliced in with scenes of the band playing multiple characters in some sort of dive bar. Billie Joe Armstrong plays the Representative of California, two fighting clients, a punk rocker and a nerd. The nerd is dressed in typical nerd suspenders and black chucks. Tré Cool plays a drunken priest, an arrested patron, and a female prostitute, while Mike Dirnt plays the bartender, another rocker, and a policeman. Like many of the songs on American Idiot, “Holiday’s” ending fades into the next track, which is “Boulevard of Broken Dreams”. This is also referenced in both of the music videos: the video for “Holiday” ending with the band’s car breaking down on a desert highway, while “Boulevard of Broken Dreams” begins with the band walking away from that same car. The video is very much an extension of the story of Jesus of Suburbia, showing his venture to the city through the lens of the band making their way through Vegas. The scenes in the bar really play into the stark difference in Jesus of Suburbia’s previous life and this new world he’s found himself in. It’s a great visual representation of this story, and the bombastic nature of the bar scenes fit really well with the songs powerful feel. A bar where everyone’s “on holiday”. Click on the links below to get a new pair of chucks to rock out in.